When the Lotus Evora debuted yesterday, we were surprised nobody made mention of the weight — it didn't show up during the live press conference, in any of the specs on the web, or in the initial press release. The real press release on the Evora has finally emerged and, drum roll, the figure is 1,350 kg, or 2,976 lbs. Shocking. We were hoping for 2,200 lbs, maybe 2,700 lbs being realistic, but nearly a ton and a half has us shocked. Not only that, but a lot more options have us scratching our heads. Does this change the way we'll look at the little 2+2? Discussion and press release below the fold. Jalopnik Snap Judgment: Okay, so its a bit on the porky side for a lotus, but it's still less than 3,000 lbs and can theoretically carry four people, if two of them are small. It was really upon learning that in addition to the fancy interior and high end audio system, power folding rear view mirror are standard and rear-view camera is optional. What kind of madness is this? And then we saw it — a press release titled "The vital accessory for the modern woman is the new, seductive sportscar from Lotus." NOOOO. Not only that, but in the detailed press release we saw another heart stabber "lifestyle." After a hyperventilation session, we calmed down and reasoned with each other that yes, it would probably still be a screamer on the track, but now it just feels so... tainted. The vital accessory for the modern woman is the new, seductive sportscar from Lotus. Inside the Evora the new Lotus is both stunning and luxurious and provides drivers with high quality tactile materials and thoughtful details. Its elegantly styled cabin is sumptuously trimmed with rich leather and features contemporary brushed aluminium surfaces, whilst the latest in-car entertainment equipment adds comfort to style for optimum driver indulgence. A 2+2 passenger configuration, children can sit comfortably in the rear of the Evora and the boot is large enough for the weekly shop or a couple of overnight bags perfect for a business trip or a weekend away at the latest boutique hotel. The Evora is not just a practical, ecological, stunning car - it's a true sportscar with power and speed. It's a car for girls who want to have serious, sophisticated fun and the instant antidote to the stresses everyday life throws at today's professional, stylish woman. Driving this car gives you an instant and addictive buzz, the commute has never been so much fun! Designed in-house by Lotus Design, Head of Design, Russell Carr, explains "Evora's dynamically sculptured form and dramatic proportions communicate visual drama, speed and agility even when the car is standing still. Sportscars are primarily an emotional rather than a rational purchase and so the design must seduce with its beauty and distinctive character. However, the modern customer also demands that the product offers real-world usability as well as exotic imagery. Therefore every element of the car's exterior and interior has been carefully designed to create a product that offers comfort and convenience as well as traditional performance car attributes." A design language of dynamic lines and fluid surfaces that flow from the 'Lotus -mouth' and over the length the cars toned form are unmistakably 'modern Lotus'. They instantly convey a sense of agility and athleticism that is intrinsic to the car's driving persona. On Evora they are complemented by the distinctive wraparound visor screen but have been subtly tailored to suit the more sophisticated character of the car, optimise high-speed aerodynamics and artfully disguise the unique 2+2 layout. The cab forward proportion combines with muscular haunches and optimised intake detailing to instantly inform the viewer that this is a serious mid-engine sportscar. Elsewhere a Lotus philosophy for combining function with beauty is evident in the downforce generating, top exit radiator vent, rear diffuser and rear wing. Inside the car the forms echo the exterior with fast moving surfaces that wrap around the cockpit cosseting the occupants, the contrast colour band that flows from the instrument cluster and sweeps around the cabin highlights this theme. "We recognise that 'touch' not only assists with driving enjoyment but also conveys messages about quality and therefore great attention has been paid to all the areas where the driver interfaces with the car." Carr explains. Figure hugging adjustable sports seats and flat-bottomed steering wheel instantly communicate the driving potential of the car. Evora employs premium quality material and finishes to create an exclusive, British handcrafted ambience that is unique in this price segment. Modern, precision-engineered aluminium inserts and hi-fi quality, edge-lit switches are brilliantly juxtaposed against the traditional contrast stitched leather panels. In a world launch by partners Alpine, Evora boasts a truly cutting edge in-car entertainment and navigation system. The multi-media system features a 7in touch-screen providing advanced audio, satellite navigation, Bluetooth hands-free telephone and iPod® connectivity functions; the screen also serves as a monitor for Evora's optional reversing camera. The satellite navigation element of the system has a removable hard-drive, allowing you to programme it from the comfort of your home or use it as a roaming satellite navigation unit and MP3 player. When unoccupied, the rear seats provide a convenient stowage area for briefcases and jackets, adding to Evora's appeal as an everyday car. The boot, which ingeniously features a fresh air cooling system to reduce the effect of heat ingress from the engine bay, will accommodate a set of golf clubs. A two-seater derivative of Evora is planned and will have a luggage shelf in the back replacing the two rear seats. Lotus' Evora conforms to all regulatory standards and in addition boasts additional safety features; Lotus aluminium chassis technology applied to the Evora provides the car with immense inherent strength, particularly in regard to side impacts and a tubular steel seatbelt anchorage frame that also acts as a rollover structure. Lotus continues its excellent working relationship with Toyota, world leaders in engine development and manufacture and Formula 1 competitors. For Evora, Lotus has modified Toyota's 3.5-litre V6, with dual VVT-i ('intelligent' variable valve timing) for optimum performance. At the time of unveiling, full performance figures for the new Lotus will not have been compiled on a production specification car, however Lotus has a further 6 months of development time to conduct these before Evora is available to test drive. The first all-new Lotus since the iconic Elise made its debut in 1995, The Evora enters the sports car market as currently the world's only mid-engined 2+2. Powered by a Lotus-tuned 3.5-litre V6 engine producing 280 PS, and weighing just 1350 kg (prototype specification), the Evora promises breathtaking performance. During preliminary testing around the famous Nürburgring, the Lotus chassis engineers report that it is extremely agile and great fun to drive - even when clad with the full development disguise that hid the beautiful lines from the prying motor-industry paparazzi. In addition to its excellent performance and exemplary handling, the Evora offers a more refined ownership experience than Lotus's existing smaller four-cylinder models. Its elegantly styled cabin is elegantly trimmed and its equipment list includes contemporary features such as an advanced touch-screen multi-media system and electric power-fold door mirrors. Because one of the roles of the Evora is to attract new customers to the Lotus brand, much attention has been paid to its ease of use. Wider, taller door apertures and narrower sills make getting in and out of the cabin a less athletic undertaking than it is in Lotus's smaller sports cars (the Elise, Exige, Europa and 2-Eleven), while the design of the cabin itself will accommodate two 99th percentile (6ft 5in tall) American males in the front seats. The 'convenience factor' of the Evora extends to less obvious areas of the car. For instance, beneath the skin the entire front-end structure is a high tech aluminium sacrificial modular unit, attached to the main extruded aluminium tub. This modular unit is designed to deform for maximum safety, and to reduce repair costs in the event of a frontal impact. The Evora will be hand crafted and built on a dedicated new assembly line within Lotus's advanced manufacturing facility at Hethel in the east of England; capacity limitations will restrict production to approximately 2000 cars a year, ensuring the dynamic new sports car's rarity and exclusivity. Mike Kimberley, CEO of Group Lotus plc, has this to say about the exciting new model: "The Evora is the biggest milestone Lotus has achieved since the Elise was born 13 years ago and is part of our bold five year strategic plan, which includes the introduction of new cars and technologies to many more markets around the world. The Evora also represents Lotus core values of performance through light weight and efficiency and proves that you can have phenomenal performance, fuel efficiency elegant design and practicality all in a class leading mid-engine 2+2 sportscar, which will meet global safety and homologation standards"
Mike Kimberley continues, "Looking to the future, we will continue to research, develop and produce lighter, more efficient vehicles which are linked to our extensive and well-regarded work on all aspects of future fuels, alternative engines and electric and hybrid vehicle solutions for the future. We all have an environmental responsibility to future generations and the Evora is another example where Lotus is seen to make significant steps towards improving the efficiency and sustainability of the motorcar keeping Britain at the forefront of the high technology motor industry." Designed 'in-house' by Lotus Design, the sleek and athletic form uses fluid forms and crisp surfaces to communicate velocity, agility and sophistication. Low and wide with modern cab forward proportions, muscular rear haunches and function optimised hip air intakes this is clearly a serious mid engined sportscar that skilfully hides the practicality of its two plus two capability. Russell Carr, Head of Lotus Design, led the Evora's design team with Steven Crijns, Design Manager responsible for the exterior and Anthony Bushell, Senior Designer, responsible for the interior. "A cornerstone of the design's success was working closely with the technical team to develop a package that allowed us to get the proportions correct," says Head of Design Russell Carr, "The asymmetric wheel sizes, the short rear overhang, long front overhang and cab forward visor screen all contribute to giving the car visual movement and an agile stance. This is incredibly important to us because we want the car's aesthetics to communicate its driving characteristics". Lotus products have always embodied a perfect balance between form and function and the Evora successfully continues this heritage. "We never lost sight of the fact that, although this car must provide real world useability, sportscars are emotional purchases and that you have to seduce the customer through beguiling looks and exotic persona. We are, therefore, very proud that we have been able to use technical and user functionality to positively drive the design in key areas and create some of the car's most distinctive features". says Carr. Ingress and egress, for example, dictated a minimal "step-over" to get into the Evora. We simply cut away the surface under the door and created a unique and dramatic piece of sculpture that enhances the stance of the car as well as its useability. Elsewhere, aerodynamic considerations for drag, down force and cooling had significant but positive influence on the overall form and details such as air intakes. A desire to create balanced down force, that increases cornering performance, led to the adoption of, the now, "signature" top exit radiator vent, race car inspired diffuser and "floating rear wing". Drag limitation, drove the dramatic tear-dropped cabin layout and the curvaceous plan view has given the car a more muscular rear shoulder and conveys a level of sophistication appropriate to this market segment. "We believe that our designs should be honest as well as dramatic and so we are really pleased with the fact that these iconic features all do a real job" says Steven Crijns, Design Manager. This inherent understanding of the relationship between the technical and the aesthetic paid dividends the first time a full-scale model of the Evora was wind-tunnel tested - only minimal adjustments were required to the car's aerodynamic package to meet the targets for downforce and stability. Steve Crijns continued, "Overall the design language shows a clear DNA link with its Lotus siblings, whilst establishing its own distinctive and contemporary theme. The undulating shoulder line is brilliantly mirrored in the lower part of the bodyside by the cut -away sill that creates a torseau-like muscularity." "The front three-quarter view is really powerful" Russell Carr continues, "Your eye is drawn effortlessly, from our signature mouth, rearward by fluid surfaces and fast lines that create a sense of speed even when the car is stationary. From this angle you can also see how dramatically the visor screen sweeps around the teardrop form of the cabin and the gently waisted plan shape perfectly accentuates the muscularity of the rear fender. This is unmistakeably mid engined language and the Evora is unmistakeably a Lotus." The view from the rear three-quarters is just as striking and the one that many will become familiar with as the car passes them on the road. The tapered cabin, diffuser, floating wing, centrally mounted twin tailpipes and distinctive engine bay vents all combine to create a completely unique look. The design language of the interior reflects that of the exterior - simple, fluid surfaces, soft forms and crisp feature lines wrap around the cabin cosseting the occupants. Unlike recent Lotus products that use a race car inspired, technical minimalism, the Evora employs a softer approach that utilises premium quality materials and finishes to create a contemporary but luxurious ambience that is unique to Lotus products. It is, according to Head of Lotus Design Russell Carr, "A huge departure from what people might expect based on Lotus's recent past. We wanted the Evora's cabin to feel special and to be surprising as well as sporty. Precision engineered metal inserts and quality edge-lit switches are brilliantly juxtaposed against soft hand-stitched leather surfaces to give a modern interior with a classic twist." Russell Carr continues, "The flat bottomed steering wheel, figure hugging sports seat, contemporary instrumentation and ergonomically positioned controls provide an intuitive environment that instantly forms a connection between driver and car ensuring that it becomes an extension of his or her body." Anthony Bushell Senior Designer explained about the choice of materials in the Evora's interior, "Tactile quality is incredibly important within this segment and so we wanted the interior to use honest premium materials. Much of the switchgear is bespoke, and every metallic component is actually metal." Focused courtesy lighting is used throughout the interior, giving a spectacular illuminated feel to the sculpture design feature of the cabin. The extensive use of handcrafted, premium leather differentiates The Evora from other Lotus products and such is its importance to the character of the car that an entire new trim shop has been built at the Lotus Headquarters in the UK, dedicated to its production. Even the entry level versions of the Evora will feature leather-upholstered seats, upper door trim panels and facia, but it is expected that most customers will opt for the full hide treatment. With a range of leather colours available, customers will have the opportunity to personalise their Evora. Contemporary technology also features in the Evora's cabin. A newly developed Alpine multi-media system with a 7 inch touch-screen provides advanced audio, satellite navigation, video, Bluetooth® hands-free telephone and iPod® connectivity functions; the screen also serves as a monitor for The Evora's optional reversing camera. The satellite navigation element of the system is removable, allowing you to programme it from the comfort of your home, or take it with you to continue your journey in an unfamiliar pedestrian location. The Alpine audio set-up is one of the most sophisticated automotive systems in the world. Called IMPRINT and using MultEQ sound enhancement technology, it is able to cancel out sound imbalances, caused by the cabin window glass, for instance, creating echoes, while carpets suppress mid-range frequencies - resulting in amazingly crisp, clear, undistorted sound reproduction wherever you are seated in the car. A bespoke air-conditioning system developed by Bergstrom is standard on all models, and has been designed for the hottest climate or the closest humidity to help provide maximum occupant comfort. Lotus traction control and on-board tyre pressure monitoring will also be available. The front seats themselves are very supportive and leather clad with a lightweight manual adjustment mechanism for fore and aft, rake and lumbar, designed to give a supported driving position. The rear seats of 2+2 versions of the Evora -are intended for children and smaller adults. There will also be a two-seater derivative with a luggage shelf in the back. To maximise comfort in the rear, there's a decent amount of foot-room under the seats in front, while both back seats feature ISOFIX mountings for secure child seat fitment. When unoccupied, the rear seats provide a convenient stowage area, adding to the Evora's appeal as an everyday car. The 160 litre boot, which ingeniously features a fresh air cooling system to reduce the effect of any heat ingress from the engine bay, will also accommodate a full set of golf clubs. With the Elise and its derivatives, the no-compromise character of the car makes getting in and out across a wide sill and through a comparatively narrow door/window aperture part of the charm of ownership. For the Evora and its remit for the serious daily driver, and to attract newcomers to the Lotus brand, greater convenience and practicality is provided. As a consequence the sill is now lower and slimmer (80mm wide compared with 100mm in the Elise), and the whole door aperture taller. The doors open wider than on the Elise and its siblings, while the height of the front seat is raised by 65mm. But while The Evora is undeniably more 'lifestyle' in respect of its everyday practicality, once you're seated behind its flat-bottomed steering wheel, it feels every bit as exotic and sporting as you would expect a Lotus to be. In common with the Elise and its derivatives, The Evora's bonded extruded aluminium chassis tub has incredible inherent strength, particularly in regard to side impacts. Additional torsional strength is given to the whole structure by the tubular steel seatbelt anchorage frame that also acts as a rollover structure. Deformable sacrificial aluminium front and steel rear subframe modules are attached to the tub using joints which are designed to minimise damage to the tub, protecting the main passenger cell in the event of an accident. Driver and passenger airbags are standard. The airbag on the passenger side is cleverly engineered to deploy vertically and then be deflected rearwards by the windscreen, to provide protection for children as well as adults. Anti-lock brakes are standard on all models, as is Lotus Traction Control (LTC); these systems have been specially developed in co-operation with Bosch and enable up and coming drivers to consistently exploit the braking and acceleration capabilities of the Evora, whilst allowing skilled enthusiasts the freedom to enjoy the full Lotus driving experience. The Evora's chassis is an evolution of the Versatile Vehicle Architecture (VVA) from the Lotus APX concept vehicle previously showcased at the Geneva Motorshow, and allows for the development of a range of vehicles up to a gross vehicle weight of 1,900 kg. This architecture has been designed to be more applicable to mid-volume applications by utilising our low capital investment manufacturing processes. The Evora structure progresses the Lotus 'bonded and riveted' technology used in the Elise family of vehicles with unique extrusions and folded panels, whilst providing contemporary ease of ingress/egress, build modularity and improved, lower cost repairs. The Low Volume VVA architecture has been designed so that it can be extended in width, length and height. The strength and stiffness of the low volume VVA chassis can be modified cost effectively by varying the wall thickness of the extrusions, without altering the exterior dimensions. The ability to lengthen or shorten extrusions with the option to tailor the chassis stiffness, vastly increases the number of vehicles that can be developed from this vehicle architecture. Front and mid engine installations have been considered, as well as hybrid and Electric Vehicle (EV) applications. The Lotus Evora employs a composite roof as a stressed structural member to give an exceptional vehicle stiffness of 26,000 Nm per degree, thanks in part to the seatbelt anchorage frame's secondary function as a roll over structure, and partly because the high-tech composite body panels are stressed items. However, despite this high stiffness, the complete chassis and modules weight just 200 kg (prototype weight), helping to keep the weight of the whole car to just 1350 kg (prototype weight). To deliver this high performance structure, bonded and riveted high grade aluminium extrusions and simple and elegant folded sheet elements are used in the lower structure, building upon award winning research projects in this field. Lotus pioneered the technology of bonded aluminium extrusions for use in road vehicles and has successfully developed high performance cars for other car companies around the world. The central tub is attached to an extruded aluminium subframe at the front and a lightweight welded steel subframe at the rear. These subframe modules also offer advantages in terms of convenience and low cost of repair, and during manufacturing can be brought to the production line fully assembled, ready to be attached. The high technology Lotus Evora chassis will be manufactured at the new Lotus Lightweight Structures facility in Worcester, UK. LLS employs 120 skilled engineers, technicians and sales staff and will manufacture all the Lotus aluminium structures, including those for the Elise, Exige, 2-Eleven and Europa and aluminium and composite structures and components for Lotus's extensive global client base. The Evora suspension wishbones are forged from aluminium to reduce the unsprung mass. These are similar in weight, and stiffer than the steel items found on the much smaller Elise, Exige and Europa vehicles, and have a far higher vehicle weight capacity. They are attached to the front and rear modules via bespoke bushes. The Evora will use Bilstein high performance dampers and Eibach springs with unique dual path top mounts for optimised vehicle refinement. Hydraulically assisted power steering is provided by a Lotus tuned TRW steering rack. All in all, the Evora delivers. It has incredible Lotus handling and provides unsurpassable driving pleasure. In fact, word from the ride and handling team is that the new car is likely to become a class standard-setter for speed and agility. Vented and cross-drilled brake discs - massive 350mm items on the front and 332mm at the rear - and high performance bespoke Lotus AP Racing 4 pot callipers ensure impressive stopping power. Everyone connected with the brake testing programme, conducted on the punishing corners, climbs and descents of the Nürburgring, has described the brakes as 'phenomenal' with excellent thermal performance and outstanding feel even after extended sessions of extreme use. Part of that testing programme was to finalise settings for the ABS system being developed in conjunction with Bosch. The system is set to very high thresholds and operates so progressively that drivers are often unaware that they have actually triggered the ABS. The Switchable Lotus Traction Control (LTC) system has been developed simultaneously with the ABS and works through the engine management system to reduce power when required to maintain traction. Unlike many traction control systems, LTC has been tuned to complement the skills of the driver without taking over. The Lotus LTC is active above 5 mph (8 km/h) and operates much more quickly than many brake based systems. The system can be deactivated completely, giving no traction control intervention. Keeping a grip - 18 inch at the front, 19 inch at the rear. Tyre choice is a vital component in the handling performance of every Lotus and for the Evora, Yokohama was chosen as development partner. Lotus's long-term relationship with Yokohama was swiftly rewarded during development when initially the front tyre size did not generate the Lotus required lateral grip, the Japanese grip gurus went away and developed bespoke tyres especially for the Evora - a 225/40 ZR18 at the front and larger diameter; 255/35 ZR19 at the rear. Both have carcass construction and a rubber compound unique to Lotus and are identified by the letters 'LTS' on the sidewalls. The exceptional working relationship that Lotus has enjoyed with Toyota over several decades, combined with the overwhelmingly enthusiastic reception for the company's four-cylinder power units in the Elise and Exige, guaranteed the Japanese giant's inclusion on the shortlist for the Evora engine supplier. The final choice was Toyota's all-alloy 2GR-FE 3.5-litre V6 DOHC, with dual VVT-i ('intelligent' variable valve timing). Lotus has painstakingly developed its own T6e engine management software for this engine to optimise its compatibility with the unique requirements of the Evora to give a peak power output to 280 PS at 6400 rpm, while boosting its maximum torque to 342 Nm at 4700 rpm (prototype figures). Changes to the engine management and exhaust systems also allow the V6 to rev more freely and provide rapid throttle response; feedback from the development team suggests that the strength of the engine's mid-range torque means that gutsy performance will be easily accessible without having to thunder through to the redline. This makes the Lotus Evora a thoroughly satisfying car for everyday road use and a rewarding one when you just want to drive. The 2GR-FE V6 engine is mated to a manual six-speed gearbox, again Toyota-sourced. A close-ratio version of this gearbox is also currently under development for the even more sport-focussed driver. Many Lotus owners enjoy the blend of unique performance and efficiency that the brand's cars offer. True to the Lotus value of "performance through light weight" CO2 emissions are expected to be a class leading sub-225 g/km (prototype figures) while testers report fuel consumption in the region of 30+ mpg (pending formal homologation testing). At the time of its unveiling, full performance figures have yet to be compiled on a production specification Lotus Evora, Lotus has another 6 months development to conduct. It's a global car, so the Evora has been tested around the world. From the icy wastes of the arctic to the heat of the desert, the high altitude of the Alps as well as the country roads around the Hethel factory. It has spent hours howling around the Nürburgring and endlessly lapped Lotus's test track at Hethel. By the time the Evora enters production, prototypes will have travelled for hundreds of thousands of miles along some of the worst public roads in the world and been tortured for as many miles on some of the toughest proving grounds the motor industry has to offer including extreme pave tests, to Australia and even the Arizona outback. It has been flung into barriers at low and high speeds, at a multitude of angles, including head-on; it has even had its roof compressed! By the time the Evora reaches the Lotus showrooms from Spring 2009 onwards, it will be the most thoroughly tested Lotus car in the history of Lotus. It will also be one of the company's great milestones. The order book is now open in the UK and across continental Europe, with markets around the world to start taking orders in due course. Final specifications, options and prices of the production Lotus Evora will be published closer to the sale date in the many Lotus markets around the world. The main operating subsidiary of Group Lotus plc is Lotus Cars Ltd, which has two operating divisions - Lotus Engineering and Lotus Cars. Lotus Engineering is an internationally recognised automotive engineering consultancy based in Norfolk, UK. Global facilities include those in Michigan (USA), Kuala Lumpur (Malaysia), China and offices in Germany and Japan, with rapid expansion in new territories such as South East Asia and the Gulf States. 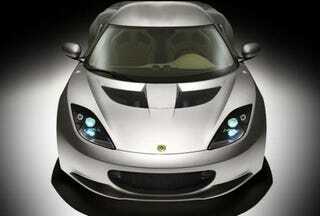 Lotus Cars builds world class, prestige, high performance sports cars for sale in 37 countries. These include the iconic Lotus Elise, and the Exige and Europa. Lotus is a global high-tech company, expanding and committed to driving forward technology for both Lotus Cars and its Engineering clients, spearheading research into such areas as hybrids, electric vehicles and renewable fuels.